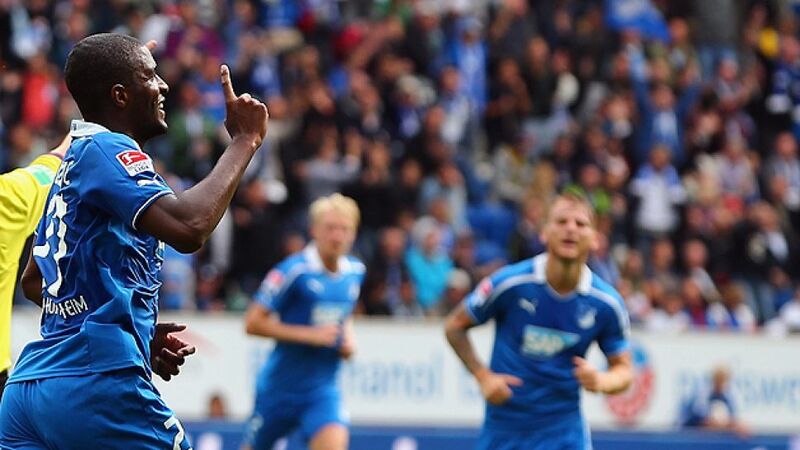 Sinsheim - 1899 Hoffenheim climbed to seventh place in the Bundesliga table courtesy of a 2-1 victory against Borussia Mönchengladbach, their first home win of the season. Anthony Modeste headed the hosts in front with his fourth goal of the season before turning provider, as Kevin Volland grabed the goal his performance merited, curling in brilliantly from a tight angle. Gladbach pulled one back through substitute Branimir Hrgota, but an equaliser eluded them as 1899 took the points in a pulsating encounter. Hoffenheim were without their talismanic midfielder Roberto Firmino, a big loss consideringthe Brazilian had scored three and assisted as many in his first four league games this season. Nevertheless, the hosts made a blistering start to the game and almost broke the deadlock inside five minutes only for Volland’s superb curling strike to come back off the woodwork. Gladbach, so impressive in their last game against Werder Bremen, struggled to find any real rhythm in the opening stages, and although they were enjoying the majority of possession, they failed to test Koen Casteels, with a wayward shot from Juan Arango rather typifying their first-half display. The pace of the game had slowed considerably since Volland’s early attempt, but towards the end of the half, the action came to life once again, culminating in Modeste’s opener. Gladbach had wasted a good chance when Patrick Herrmann shot wildly over, and they were made to pay moments later when the Frenchman’s header crept in via deflection off Filip Daems. It seemed that the half-time break had come at the perfect time for the visitors, as they made a strong start to the second period. Arango’s dipping effort could only find the side netting, while Raffael's fierce drive failed to truly trouble Casteels. As a result, it came against the run of play when Volland ran onto Modeste’s pass, turned inside Filip Daems and curled into the far corner to double Hoffenheim’s lead. Gladbach were staring down the barrel of defeat, but boasting more strength in depth than last season, hauled themselves back into the game courtesy of two super-subs. Amin Younes played a short pass to Hrgota, and the big Swede fought his way through three challenges to chip his effort over Casteels and into the net via the inside of the post. It set up a frantic, end-to-end finale, as both sides looked to strike a decisive blow. Daems was denied by a great block from Casteels after a clever pass from Hrgota and Luuk de Jong fired wide after a scramble on the edge of the Hoffenheim box. At the other end, 18-year-old Niklas Süle glanced a header wide from Volland’s majestic pass, which proved to be the last notable action of a thrilling encounter as Hoffenheim collected three points on home soil for the first time in the current campaign.